So the mainstream media are arrogantly pretending they didn't in fact call the by-election wrong by parroting the brainfart opinion polls with failed David Farrar methedology that claimed Hone was only ahead by 1% when in fact they were out by over 7%. They are saying 'it was close' and that Hone got in by just a whisker and downplay the repeat mistakes they made with predicting the Brown-Banks election by not questioning their performance or putting the win under any critical analysis. Now the Prime Minister is saying the by-election was a waste of money. Really? The chap who has signed off on those luxury limos and gets taxied around to black tie Royal Golf club dinners by the NZ Air Force who says poor people who get food parcels are responsible for their predicament is lecturing Hone on cost is he? Hone sort a mandate, this is a democracy a mandate MUST be given by the people, that's the cost of democracy and it's a pretty cheap cost for a value that is priceless. What is the alternative? The filthy dirty back door corporate coups of the ACT Party where a political zombie wakes from his cryogenic chamber fuelled on the tears of solo mothers to take over the party with no membership say whatsoever? Is that what we want as a political process? The elites just buying themslves political positions? How ugly and contemptuous and anti-democratic is that? Hone sought the mandate and he has it, and he won it with a far larger margin than the 1% parroted by the mainstream media. Why is it a waste of money when Hone does it, yet it wasn't a waste of money when Botany by-election was called? Voter turnout in the Te Tai Tokerau 2011 by-election was 41.36% and John Key says that is a waste. In Botany it was only 36.44%, yet John didn't say that was a waste. The difference between the 2008 election and the by-election turn out in Te Tai Tokerau was 22% less voters voting and John Key says that is a waste. Yet the difference between the 2008 Botany election and the by-election was 40% less voters voting and yet John Key didn't say that was a waste. Funny how it's only a waste when it's a Maori electorate even though that electorate has had a higher turn out and more democratic interaction than his beloved Botany. The Prime Ministers claim that the Te Tai Tokerau by-election was a waste is a joke looking for a punchline. Hone got 48% of the vote. In '08 the national party got 44% across NZ. 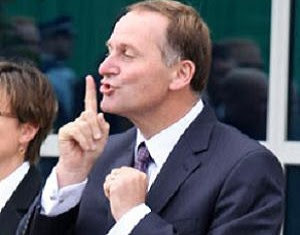 It was funny to hear John Key talking about "mandates". More of that please, Mr Key. So voters can see how you twist things to fit your case. 15k headline of the day...key kisses krazy kurry koal's khazi,kapow!kranky kockshorn kries karcase karting kan kickoff kwik. Just saw Goff on One News, and he once again reiterated that he would not form a coalition with Mana under any circumstances. This IMO pretty much guarantees a National coalition post election, although I guess that was pretty much baked in anyway. Phil Goff should do with less of the arrogant "We Will Not Go With Mana" and simply adopt a wait and see as to what voters deliver on November 26. It is this same arrogance which saw voters turn away from Labour in 2008.